Newcastle Pride takes place on Saturday 22 July and we'll be there showing our support with our very own Pride bus, along with a host of other activities on top of what Pride already has to offer. We'll have our Quaylink Pride bus, face painting, giant volleyball, outdoor games, selfie buses and more! Plan your journey to the heart of Newcastle Pride with us – and don't forget to come and say hello when you get there. 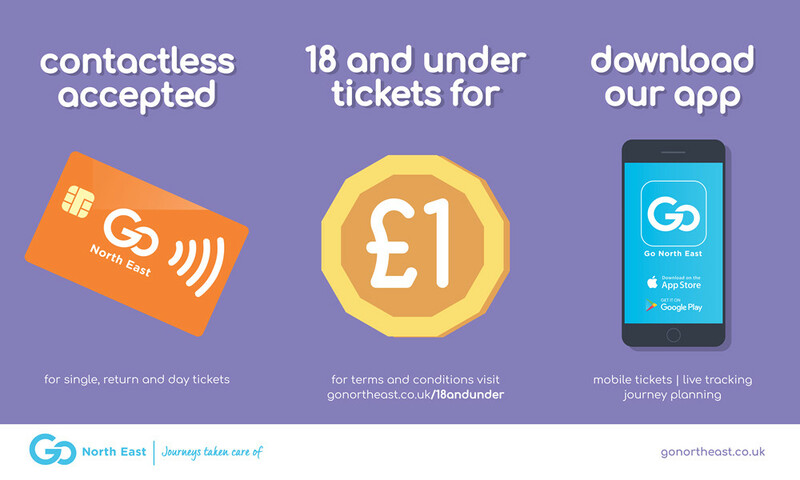 You don't even have to worry about having change for the bus – you can now pay with contactless for single, return and day tickets. 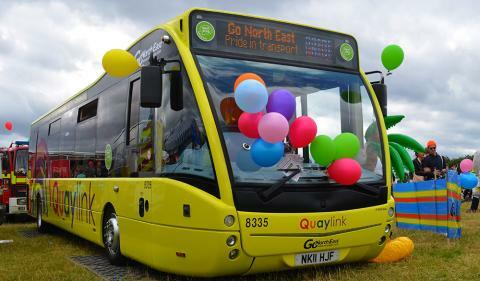 Other than at Newcastle Pride, you can find our Quaylink Pride bus running in and around Gateshead and Newcastle all year round, showing our support and promoting awareness of equality for LGBT communities across the region. Click here to find out more about Quaylink. Services 56 & 58 from 12.30pm to 1.30pm - will not run into John Dobson Street or New Bridge Street and will terminate at Market Street (Old Police Station), departing via normal route towards High Level Bridge. Service 57 from 12pm to 1.30pm - will omit Sandyford Road and St. Mary's Place and divert via Portland Place (inbound) or Osborne Road (outbound) then Central Motorway to Durant Road/New Bridge Street roundabout to John Dobson Street and Market Street (not New Bridge Street or Pilgrim Street). Service Q3 from 12pm to 12.45pm - northbound will omit St. Mary's Place and John Dobson Street and run via southbound route in reverse from Market Street to Newgate Street and Haymarket. Both directions from 12.45pm to 2.30pm will omit Eldon Square and Haymarket and will run via John Dobson Street, Sandyford Road, Osborne Terrace, Central Motorway and Great North Road in both directions. Services 309 & 310 from 12pm to 1pm - will omit Sandyford Road and St. Mary's Place and will run to and from Haymarket via Portland Terrace (inbound) and Osborne Terrace (outbound) and Central Motorway, Great North Road and Barras Bridge. From 1pm to 2.30pm will not be able to reach Haymarket and will run normal route to St Mary's Place, then left to John Dobson Street and terminate. Turn bus via Durant Road, Central Motorway roundabout and Durant Road, returning to top of John Dobson Street to depart back towards the coast. Services 21, 27, 28/28A, X1, X9, X10, X21, X25, X31 and X70/X71 from 12.30pm to 2pm - will omit John Dobson Street, New Bridge Street, Blackett Street and Percy Street to Eldon Square and outward route to Newgate Street and will instead run to Market Street after Hole-in-the-wall and terminate outside the old police station. Departing from Market Street run via normal route towards High Level Bridge. Services 10/10A/10B, 12/12A, 45/46, 47 from 1pm to 2.30pm will be unable to reach Eldon Square and will terminate at Clayton Street West, commencing outward journeys from Central Station. Service 6 from 12.15pm to 2.30pm - will terminate at Clayton Street inbound. Service X31 will terminate at Market Street. Services 1, 11, 53/54, 97 and Q1/Q2 are not affected and will remain on normal route.